POLITICAL TIDBITS: P-Noy’s P70, 000 bail forked out for new Comelec Commissioner Grace Padaca, however well-intentioned, has to be construed as bribery that compromises her independence---so crucial in the 2013 elections. Recalling canonization of Opus Dei’s Founder, St. Josemaria Escriva, by Pope John Paul II at the Vatican ten years ago today. P-Noy’s P70, 000 bail forked out for new Comelec Commissioner Grace Padaca, however well-intentioned, has to be construed as bribery that compromises her independence---so crucial in the 2013 elections. Recalling canonization of Opus Dei’s Founder, St. Josemaria Escriva, by Pope John Paul II at the Vatican ten years ago today. President Noynoy seems to be deliberately courting impeachment (fully aware, perhaps, that Congress is securely in his pocket). First, P-Noy, who is LP Chair, pays from his personal funds the P70, 000 bail of former Gov. Grace Padaca whom he has just appointed as the 7th Commissioner of the poll body. There’s no other way to look at this bail that P-Noy, however well-intentioned, forked out except as bribery of his new appointee. This early it compromises Padaca's independence as Comelec Commissioner---so crucial in view of the coming mid-term elections that P-Noy's Liberal Party obviously intends to sweep. Reading about how she was in near-tears as she thanked P-Noy profusely for her recent appointment and his bail for her, one is left to wonder if Padaca’s senses haven’t taken leave of her. How can she fail to understand that the bail bond he posted for her is unacceptable in her new position? She stressed that she’s out to institute reforms in the Comelec. This is not hard to believe as she came into the governor’s post in Isabela with the reputation of an idealist. But how can that be possible now at the Comelec, if her independence has been compromised from the start with this debt of gratitude to the President? This also seriously puts into question her sense of judgment in the Comelec that's supposed to be an INDEPENDENT CONSTITUTIONAL BODY. In fact, as if to stress how important it is to appoint Padaca to the Comelec, P-Noy even ordered DILG Secretary Mar Roxas--- president-on-leave of the Liberal Party but who remains so visible in LP political gatherings such as in Pampanga recently---to accompany her in posting that bail at the Sandiganbayan. But aside from infringing on the independence of the Comelec, these Palace moves may also be construed as undue interference of the Executive Branch in the workings of a co-equal and independent branch, the Judiciary (represented here by the Sandiganyaban). Not that the administration is uniformly efficient when it comes to carrying out warrants from the courts. There is clearly a double standard when it comes to allies of P-Noy, vs. those perceived to be enemies. Contrast its dragging its feet in the case of Padaca, who joined the LP some months back, after being affiliated for some time with the movement called “Kaya Natin!” that fully backed P-Noy in the impeachment case vs. Chief Justice Renato Corona earlier this year (which counted as members LP candidate for governor in Pampanga Ed Panlilio, and Harvey Keh of the Ateneo School of Government). The warrant of arrest was issued against Padaca by Sandiganbayan last May, but until now---five months later---it has not been served by the DILG. Contrast this to the lightning speed with which the warrant of arrest for plunder was served on former President GMA by a phalanx of police officers---a day after her son, party-list Rep. Mikey Arroyo, filed her certificate of candidacy at the Comelec. GMA would doubtless have been put behind bars immediately, had it not been that doctors at Veterans Hospital ruled her to be too weak to undergo imprisonment and insisted on her continued stay in the hospital. To complicate the issue, in today’s Manila Standard P-Noy was quoted as publicly clearing Padaca of the malversation charge filed against her in the graft court as governor of Isabela last May. P-Noy says that Gov. Padaca's approval of a P25 million loan for a rice hybrid project to an NGO, even though done WITHOUT BIDDING, actually helped farmers obtain cheaper credit facility. The assumption in his remark is that if something is for the good of the people, it’s okay even if the procedure taken is twisted or open to charges of graft and corruption. This is a dangerous assumption for the President to make. The administration recently sued the former PCSO board in GMA’s time, led by General Manager Rosario Uriarte, for plunder, together with the former President. But using P-Noy’s argument to justify the short-cuts Padaca resorted to in the multi-million loan---for which she was ordered arrested by the Sandiganbayan---what would now prevent Uriarte et al. from invoking the same argument: that their move benefitted a wide segment of the population? Never mind if they may have resorted to short-cut of procedures or even actual manipulation of funds. Then too, P-Noy, through his public clearing of Padaca of anomaly, is further strengthening his interference of the judiciary. How can the Sandiganbayan now proceed with her malversation case? Many people are wondering WHAT'S HAPPENING at the Palace? Where are his advisers? Today is a red-letter day for Opus Dei, for this marks the 10th anniversary of the canonization of its revered founder, Msgr. Josemaria Escriva de Balaguer. Ten years ago today, my husband and I were among the huge throng from many nations around the world that filled the entire St. Peter’s Square at the Vatican in Italy, all the way to the Tiber River---one of the biggest crowds to ever be assembled there. Under clear blue skies and crisp autumn weather, the late Pope John Paul II officiated at the unforgettable rituals that raised Opus Dei’s founder to the altar of saints of the Catholic Church. The official seal of approval by the Pope stamped on St. Josemaria Escriva’s life of virtue, which the Church ruled he had practiced to a “heroic degree,” was its way of putting to rest the controversies that had hounded Escriva’s 73 years on earth and the 84-year old “Work of God” now found in over 80 countries around the world, had stirred. In preaching what St. Josemaria called the “universal call to holiness of the children of God,” he stressed constantly that it was not only those who sought life in the convent or monastery who could come close to God and be holy. Ordinary men and women very much in the world could also come close to Him by sanctifying their work and doing it with both human perfection, through the excellence of their work, and Christian perfection, by doing it for love of God and in service to others. This precept dovetails neatly with the work ethic demanded by our modern-day world, which is probably why the Spanish-born St. Josemaria, who died in June 1975 in Opus Dei's central office in Rome, has come to be known as the “Saint for contemporary times.” Thus, over the decades since Opus Dei’s founding on October 2, 1928, the Feast of the Guardian Angels, those responding to Escriva’s challenge have come from all professions and undertakings: from bank presidents to teachers, soldiers and nurses, as well as cooks, domestics and farmhands---working people all. 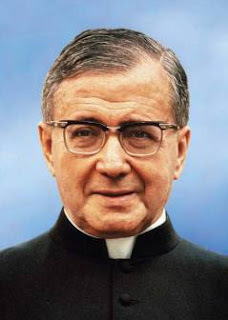 As I wrote ten years ago in my column, one pilgrim who sat gazing at St. Josemaria’s photo hanging from the imposing façade of St. Peter’s during his canonization, commented that it was the first time he had ever seen the photo of a saint with eyeglasses. That quip is also a succinct commentary: St. Josemaria, who had once dabbled in journalism and held a doctorate degree in civil law from a famous university in Madrid, apart from being a priest, is truly a saint for our times. There are many most simple and helpful bail bonds services around. When you’re looking to bail a loved one out of jail, you need a bail bonds agency that is quick, respectful, and knowledgeable. Bail 2 GO can make a stressful situation a little more bearable.